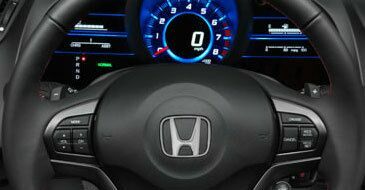 Honda was able to combine the race-inspired performance of a sports car with the environmental efficiency of a hybrid car in the CR-Z. The 2015 Honda CR-Z has a hybrid gas-electric powertrain that achieves 36 miles per gallon on city streets and 39 miles per gallon on the highway. The sports-centered racing features throughout make this 2-seat hatchback coupe a genuinely fun-to-drive car. It's fun, small, and wonderfully fuel efficient. The Honda CR-Z is the first hybrid car to have a 6-speed manual transmission that is truly engaging and efficient. The automatic transmission models come equipped with idle-stop, which temporarily turns off the engine to save fuel when the car comes to a stop. The engine restarts automatically and unnoticably once the car starts moving again. This sport hybrid coupe embodies both race-inspired sport performance with environmental efficiency, seamlessly. 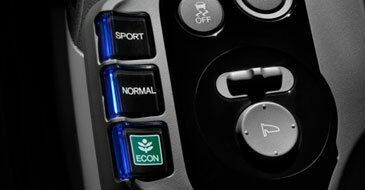 The race-inspired, steering-wheel-mounted paddle shifters allow drivers to extract more power with manual gear selection. Selecting the right gear for a corner, in an incline, and during acceleration is ideal for more enthusiastic drivers. The Plus Sport System is a push button the steering wheel that gives an immediate boost of speed for highway on-ramps and passing. Driving performance is fully customizable, allowing drivers to select Sport, Normal, or ECON mode. Power can be increased or fuel-economy can be prioritized at the driver's discretion.